A magnetosphere is the region around a planet dominated by the planet's magnetic field. Other planets in our solar system have magnetospheres, but Earth has the strongest one of all the rocky planets: Earth's magnetosphere is a vast, comet-shaped bubble, which has played a crucial role in our planet's habitability. Life on Earth initially developed and continues to be sustained under the protection of this magnetic environment. The magnetosphere shields our home planet from solar and cosmic particle radiation, as well as erosion of the atmosphere by the solar wind - the constant flow of charged particles streaming off the sun. 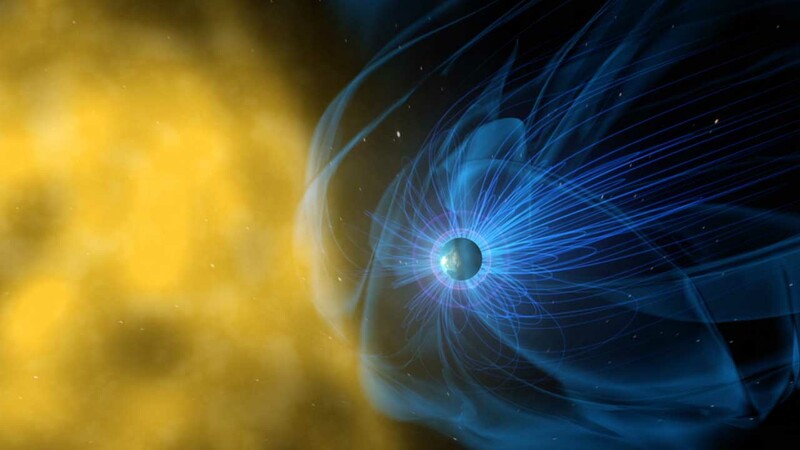 Earth's magnetosphere is part of a dynamic, interconnected system that responds to solar, planetary, and interstellar conditions. It is generated by the convective motion of charged, molten iron, far below the surface in Earth's outer core. Constant bombardment by the solar wind compresses the sun-facing side of our magnetic field. The sun-facing side, or dayside, extends a distance of about six to 10 times the radius of the Earth. The side of the magnetosphere facing away from the sun - the nightside - stretches out into an immense magnetotail, which fluctuates in length and can measure hundreds of Earth radii, far past the moon's orbit at 60 Earth radii. NASA heliophysics studies the magnetosphere to better understand its role in our space environment. Such research helps unravel the fundamental physics of space, which is dominated by complex electromagnetic interactions unlike what we experience day-to-day on Earth. By studying this space environment close to home, we can better understand the nature of space throughout the universe. Additionally, space weather within the magnetosphere - where many of our spacecraft reside - can sometimes have adverse effects on space technology as well as communications systems. Better understanding of the science of the magnetosphere helps improve our space weather models. NASA's studies of the magnetosphere include research into: understanding the nature of the electromagnetic phenomena in near-Earth space; how near-Earth space responds to external and internal stimuli; how the coupled middle and upper atmosphere respond to external factors; and how the various regions of the magnetosphere and upper atmosphere interact with each other. NASA heliophysics missions contributing to magnetospheric research are: Balloon Array for Radiation-belt Relativistic Electron Losses; Geotail; the Magnetospheric Multiscale mission, Time History of Events and Macroscale Interactions during Substorms; Two Wide-Angle Imaging Neutral-Atom Spectrometers; and the Van Allen Probes. Additionally, instruments on other NASA missions -- for example, Juno, which observes Jupiter -- observe the magnetosphere of other planets. Earth is surrounded by a giant magnetic bubble called the magnetosphere, which is is part of a dynamic, interconnected system that responds to solar, planetary, and interstellar conditions.